These words are from the Schuman Declaration, which was presented on 9 May 1950. The backdrop was war. The Franco-Prussian War of 1870 and the First World War were both fuelled by conflict over the same lands and resources. But when Europe stood among the smouldering ruins of the Second World War, beside the newly dug graves of millions upon millions, and as it witnessed the beginnings of renewed economic conflict – Europe chose a new path. West German Chancellor Konrad Adenauer is reported to have said to his staff: “Das ist unser Durchbruch” – this is our breakthrough. But the strength of the European Coal and Steel Community was not its rules and regulations. On the contrary, it did not achieve all of its goals. No, the breakthrough was not mainly economic – but political. Europe chose cooperation rather than conflict. And now, 65 years later, it is perhaps all too easy for Swedes to forget what this cooperation has created. In a country that has enjoyed peace for 200 years, we do not realise how truly strange and marvellous this European era of peace has been. When we travel by train down through Europe – on holiday, to study or to work – we perhaps do not remember the time when the carriages would be stopped at night by passport officials, when each country was like an isolated island, when distrust and doubt characterised European relations. What we now take for granted would have seemed like utopia for the founders of the EU. I remember the first time I visited the restaurant of the European Parliament and saw Germans, Greeks and Portuguese all eating together in this the melting pot of cooperation. Just as I can now sit in working meetings of the European Council and see leaders of countries – that were once sworn enemies – call each other David, Angela, Helle, Bohuslav and roll up their sleeves to work together. And this work has been fruitful. Just look at your own lives. Your dreams of studies and a career can now easily encompass an entire continent. Your supply of food and clothes is more secure, the air you breathe is cleaner, the societies you live in are freer, safer and more democratic, simply because we Europeans chose cooperation rather than conflict. Therefore I am also proud to say: Yes, I am a European. I believe in the European Union. I believe in the strength of a cooperative community. But precisely because I believe in the EU, I also know that the EU must change. The EU has bureaucratic, economic and democratic failings. But you are all well aware of the EU’s challenges. What I want to talk about are the EU’s opportunities. I became politically involved because I believe that the idea of the equal value of all people can only be realised through free and equal societies in which you and I have the same opportunities in life. And to create such free and equal societies, cooperation and solidarity are required – between people, between countries. I view the EU as an important instrument, precisely for creating this type of cooperation, this type of international solidarity between people, so that freer and more equal societies are made possible. And the breakthrough that the EU needs today is an EU that gets closer to the people it was created to serve. An EU that focuses on employment, security and sustainability – and creates forms of cooperation that make change possible. It is only by so doing that we can feel that the EU provides added value. That the Union is for us, not we for the Union. It is only by so doing that we can resist the divisive populism and fascism that is seeking a foothold in Europé. It is only by so doing that we can create an EU of the People. I would like to talk about the reforms we want to focus on in order to achieve this by talking about an app, a telephone and a baby’s bottle. I would like to begin with the application that has spread to computers, telephones and TV systems around the world. There are probably even advanced fridges that can run the software. I’m talking about Spotify. Those involved in launching Spotify must have had an admirable stubbornness. They had to negotiate with each country, one by one. And that took time. Five years after its release, Spotify was only available in half of all EU Member States. Spotify has done well. But what about all those who are still struggling? All the goods and services we haven’t heard of, just because the people making them cannot reach a wide enough circle of customers? This is why we want to have a strong internal market; one that links our economies and creates the trade volumes required to enable companies to specialise and grow. Spotify in particular also illustrates the need for a digital internal market, in which regulations are harmonised and privacy respected. And while we make it possible for private companies to invest and grow, politicians must do their fair share of the work. We support the Commission’s investment plan, in which we want to see research and innovation prioritised. But we also need to boost the measures against youth unemployment so that the European Investment Bank and the European Social Fund can create more study, trainee and work opportunities for young people. Everyone in your generation must be offered opportunities. You must be able to show what you can do. To test the limits of your knowledge. I know you are ready to take on Europe, and I know Europe needs your strength! And we must stop shutting women out of the labour market! One third of all women of working age in the EU woke up this morning without a paid job to go to. In some countries, the number is as high as half. In some quarters, views on the role of women in the labour market seem to be as old as the EU itself. What is required is childcare, parental leave, equal pay for equal work, a more balanced division of power, and an end to the violence that destroys women’s lives. Jobs and gender equality go hand in hand, and an EU of the People should stand up for both! Strengthening the internal market, which is one of our greatest successes, must not mean introversion. On the contrary! The EU must be open to the rest of the world. We should continue to be the world’s biggest aid partner, and at the same time stand up for global free trade. Sweden is a trade-dependent and trade-loving country. Free trade with rest of the world leads to growth and jobs across the country. But, if the EU does not create new trade routes, the rest of the world will not wait for us. They will merely increase their trade with other regions. We therefore want to see ambitious, ethical and comprehensive trade agreements with the United States and Japan, and a continued strengthening of the WTO’s legitimacy in world trade. We must make it easier to trade, invest and grow throughout the EU, while at the same time standing up for employees’ rights, the environment and democracy. I am part of a labour movement, which, together with the liberal political movement, has fought for more than 100 years for free trade as one of the world’s main weapons against poverty. And when the icy winds of protectionism blow, we will continue to stand up for free trade, today and in the future. That was quite a long tangent from just one app, so I would now like to move on to the telephone. When I was chair of the Metal Workers’ Union of Sweden, I sometimes received phone calls informing me that workers had died. I was often also given a short description of how the accident had happened, and despite the modernisation of our workplaces, people can still die in the most horrific ways. And so you were faced with the fact that a person was now dead. And you think about the silence that will spread throughout the workplace. You think about how they are going to tell the family. You think: why did this have to happen again? And this also affects Europeans who come to Sweden to work. Those known as ‘posted workers’ are involved in one fifth of the accidents that occur at Swedish workplaces, despite the fact that they represent a significantly smaller proportion of the labour force. We can’t go on like this. There is no natural law stating that an open European labour market should make people’s working conditions worse. We want to strengthen freedom of movement, but this is not at odds with standing up for workers’ rights. On the contrary – if we are to an EU of the People, we need the Union to be used to improve people’s working lives. We want to create good order in the European labour market, in which we strengthen employees’ rights, in which we stop social dumping and the exploitation of regulations, and in which we stand up for the principle of equal pay for equal work. This brings me to my third point, about the baby’s bottle. Although I am enjoying talking to you here today, I have to admit that my greatest joy in life is spending time with my family’s grandchildren. Playing with them, reading to them, having a little chat. But this is also why I share the dread that parents must feel when they discover that what they have been putting into their child’s mouth can be dangerous, hormone-disrupting even. But this was what happened when we understood the risks of Bisphenol A, which has been found in babies’ bottles, baby food jars and plastic beakers. And this is what often happens in environment and climate issues. First you are appalled. Then you get angry – and then you take action to create the sustainability that our children deserve. And we are now working to eliminate the environmental toxins that are a threat to people, not least through the chemicals regulation REACH, which Margot Wallström helped to develop. We also want to create an energy union that strives to achieve the EU’s climate objectives, and we want to invest in energy efficiency measures and recycling to ensure that we do not live beyond the planet’s limited resources. But the major, decisive work must of course take its cue from the international climate negotiations in Paris in December. In Paris, the EU must ensure that the world agrees on forceful climate objectives, together with a concrete action plan to achieve them. The world has to choose which path to take – and the EU must take the lead. We must phase out fossil fuels. We must create jobs by producing sustainable homes, industries and transport. And we must engage the world in an action programme that keeps us below the decisive two degrees of global warming. This, if anything, would show that the EU can be a citizens’ EU. And this, dear friends, is the only way we can look our children and grandchildren in the eye and say: We saw what was happening. We refused to allow it to happen. And we chose to act before it was too late. Dear friends, I have just come from the European Council, where foreign affairs – and particularly the situation in Ukraine – were top of the agenda. The EU Common Foreign and Security Policy is an extremely important tool, enabling us to speak with one strong voice. The EU needs to stand up for human rights wherever they are threatened, support Ukraine in light of Russia’s military aggression, strengthen its role in the Middle East and North Africa, normalise relations between Serbia and Kosovo, stay open to new members that meet the requirements, and jointly build a safer and more prosperous neighbourhood. We also need to create greater security in all of our countries for those Jews and Muslims who are afraid to pray or openly show their faith, and we need to work across borders to fight terrorism and organised crime. We need to create security for the refugees risking their lives just a few kilometres off Europe’s coast, and we need to get more EU Member States to take responsibility for receiving refugees. We need to improve the situation of the Roma and break the chains of poverty and discrimination that are forcing them to beg. It is a question of respect for the dignity of every human being, which we will never abandon. While we strengthen our global commitment and our common security, we also need to create more jobs and growth, ensure good working conditions and strengthen gender equality, international solidarity and environmental protection. These are the Swedish Government’s priorities for the EU. Together we must create an EU that is better at delivering on its promises instead of constantly delivering new promises. We must create an EU that does not take more power for the sake of power, but that shows how it can use reforms to place power in people’s hands to create a better life. And we must create an EU that shows its value in our everyday lives, not through grand statements but through real change. I say ‘we’. This is important. The EU is not ‘them’. The EU is us. And it is we, in Sweden and Europe, who will determine the future of the EU. 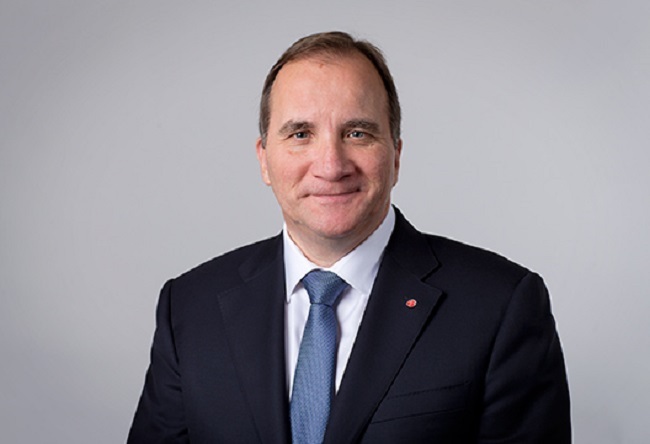 Many of you in this room will play decisive roles in this work, as you are studying to lead the institutions of Sweden and the EU in the future, perhaps even to be my successor, who knows? I say ‘we’ because we are the ones who have to do this. We are the ones who need to use the time ahead of us to shape an EU of the People, which creates a better everyday life for you – and a better world for us all. It is a difficult task indeed. But, as students, you know that the most difficult tasks are sometimes also the most rewarding.